اجلی, مهدی. (1395). 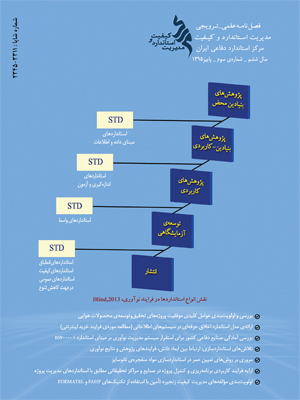 اولویت‌بندی مؤلفه‌های مدیریت کیفیت زنجیره تأمین با استفاده از تکنیک‌های FAHP و FDEMATEL (مورد مطالعه: صنعت گاز). مدیریت استاندارد و کیفیت, 6(پاییز), 88-103. مهدی اجلی. "اولویت‌بندی مؤلفه‌های مدیریت کیفیت زنجیره تأمین با استفاده از تکنیک‌های FAHP و FDEMATEL (مورد مطالعه: صنعت گاز)". مدیریت استاندارد و کیفیت, 6, پاییز, 1395, 88-103. اجلی, مهدی. (1395). 'اولویت‌بندی مؤلفه‌های مدیریت کیفیت زنجیره تأمین با استفاده از تکنیک‌های FAHP و FDEMATEL (مورد مطالعه: صنعت گاز)', مدیریت استاندارد و کیفیت, 6(پاییز), pp. 88-103. اجلی, مهدی. اولویت‌بندی مؤلفه‌های مدیریت کیفیت زنجیره تأمین با استفاده از تکنیک‌های FAHP و FDEMATEL (مورد مطالعه: صنعت گاز). مدیریت استاندارد و کیفیت, 1395; 6(پاییز): 88-103. پژوهشگران در سال‌های اخیر مفهومی را با عنوان "مدیریت کیفیت زنجیره تأمین" معرفی و توسعه داده‌اند و از آن به‌عنوان آخرین مرحله در حرکت به‌سوی "مدیریت کیفیت فراگیر" نام می‌برند که به‌واسطه‌ی آن شرکت‌ها قادر خواهند بود با ادغام مؤثر و اثربخش مفاهیم دو فلسفه‌ی مدیریتی "مدیریت کیفیت جامع(TQM) " و "مدیریت زنجیره‌ی تأمین (SCM)" و ایجاد "هم‌افزایی"و برخورداری همزمان از سه فاکتور رقابتی(کیفیت، قیمت، تحویل)، عملکرد زنجیره‌ی تأمین و کیفیت محصولات نهایی خود به مشتریان را افزایش داده و از این طریق کسب مزیت رقابتی نمایند. جهت تحقق این هدف در صنعت گاز کشور، اولویت‌بندی و ارائه مدلی علی از مؤلفه‌های کلیدی مدیریت کیفیت در سطح زنجیره‌ی تأمین، می‌تواند اولین گام در پیاده‌سازی مدیریت کیفیت زنجیره‌ی تأمین در این صنعت محسوب شود؛ زیرا تا زمانی‌که اعضای زنجیره‌ی تأمین به‌عنوان مجری پیاده‌سازی آن، حول این عوامل اتفاق‌نظر نداشته باشند و در شناخت و ادراک آن‌ها نسبت به چگونگی پیاده‌سازی آن شکاف و اختلاف‌نظر وجود داشته باشد، شکست چنین پروژه‌ای حتمی به‌نظر می‌رسد. برای این منظور در این مقاله با بررسی مؤلفه‌های کلیدی مدیریت کیفیت زنجیره تأمین و با توجه به اهمیت و حساسیت اولویت هر یک از مؤلفه‌ها جهت پیاده‌سازی در صنعت گاز، این مؤلفه‌ها با استفاده از رویکرد فرآیند تحلیل سلسله‌مراتبی فازی و از طریق نظرات خبرگان اولویت‌بندی شدند. نهایتاً با بکارگیری تکنیک دیمتل فازی، مدلی علی- معلولی از مؤلفه‌های کلیدی در صنعت گاز ارائه شده است. با عنایت به ارزیابی انجام‌شده، مؤلفه‌های تأثیرگذار و تأثیرپذیر برای پیاده‌سازی موفق مدیریت کیفیت زنجیره تأمین در صنعت گاز شناسایی شد. جعفرنژاد، احمد (1391). مدیریت تولید و عملیات نوین؛ چ 2، دانشکده مدیریت دانشگاه تهران. Kanji, G.K.,Wong,A.,(1999). Business excellence model for supply chain management.Total Quality Management10, 1147–1168. Handfield, R. and E. Nichols, Introduction to Supply Chain Management, Printece Hall, 1999. Guangshu Chang (2009). Total Quality Management in Supply Chain, International business Research, Vol. 2, No. 2. Robinson, C.J. and Malhotra, M.K. (2005), “Defining the concept of supply chain quality management and its relevance to academic and industrial practice”, International Journal of Production Economics, Vol. 96, pp. 315-37. Kuei, C., & Madu, C.N. (2001). Identifying critical success factors for supply chain quality management. Asia Pacific Management Review, 6(4), 409–423. Ferguson, B.R. (2000). Implementing Supply Chain Management. Production & Inventory Management Journal, 41(2), 64. Langabeer, J., & Rose, J. (2002). Creating Demands Driven Supply Chains How to Profit From Demand Chain Management. London: Spiro Press. Stevens, G. (1989). Integrating the Supply Chains. International Journal of Physical Distribution and Material Management, 8, 3-8. Blanchard, D. (2010). Supply Chain Management - Best Practices (Second Edition ed.). New Jersey: John Wiley & Sons, Inc.
Lummus, R.R., & Vokurka, R.J. (1999). Defining supply chain management: A historical perspective and practical guidelines. Industrial Management & Data Systems 99(1), 11-17. Lambert, D. M., Stock, J. R. and Ellram, L. M. (1998).Fundamentals of Logistics Management, Irwin/McGraw-Hill, Boston. International Journal of Operations & Production Management, 21(1/2), 71-87. Ross, D.F. (1998), Competing through Supply Chain Management, Chapman&Hall, NewYork, NY. اجلی مهدی و ایمن قاسمیان صاحبی (1395). رتبه‌‌بندی عوامل مؤثر بر مدیریت کیفیت زنجیره تأمین صنعت گاز با استفاده از تکنیک تحلیل نسبت ارزیابی وزن‌دهی تدریجی، فصلنامه علمی ترویجی اندیشه آماد، شماره 57، سال پانزدهم. Choi, T.Y., & Rungtusanatham, M. (1999). Comparison of quality management practices: Across the supply chain and industries. Journal of Supply Chain Management, 25(1), 20-27. Fynes, B., & Burca, S.D. (2005).The effects of design quality on quality performance. International Journal of Production Economics, 96(1), 339-354. Sila, I., Ebrahimpour, M. and Birkholz, C. (2006), “Quality in supply chains: an empirical analysis”, Supply Chain Management: An International Journal, Vol. 11 No. 6, pp. 491-502. Fernandes, Ana Cristena, Paulo Sampaio and Maria do Sameiro Carvalho (2014). Quality Management and Supply Chain Management Integration: A Conceptual Model, Proceeding of International Conference of Industrial Engineering and Operations Management, Bali, Indonesia, January 7-9. صفری حسین و امید محبی منش (1390). "ارائه مدل مفهومی مدیریت کیفیت زنجیره‌ی تأمین (SCQM) و بررسی وضعیت آن در صنعت خودروی ایران (مطالعه‌ی موردی: پروژه تندر 90 شرکت ایران‌ خودرو)"، نشریه مدیریت صنعتی دانشگاه تهران، دوره 3، شماره 7. Saaty, 1995. Decision making for leaders. The analytical hierarchy process for decisions in a complex world. RWS publications, Pittsburgh. Cathy M., Johan S., Klaas D.B., Alain V., PROMETHEE and AHP: The design of operational synergies in multi-criteria analysis. Strengthening PROMETHEE with ideas of AHP, European Journal of Operational Research 153 (2004) 307–317. Vaidya, O.S., Kumar S., 2006. Analytic hierarchy process: an overview of applications, European J. Oper. Res. 169, 1–29. Dagdeviren, M., 2008. Decision making in equipment selection: an integrated approach with AHP and PROMETHEE. Journal of Intelligent Manufacturing, 19, 397-406. Konidari, P., Mavrakis, D., 2007. A multi-criteria evaluation method for climate change mitigation policy instruments. Energy Policy 35, 6235-6257. Bellman, R., & Zadeh, L. A., 1970. Decision making in a fuzzy environment. Management science, 17(4), 141–164. Eneat M., T. Piazza, 2004. Project selection by constrained fuzzy AHP, Fuzzy Optimization and Decision Making 3, 39–62. Erensal Y.C., Öncan, T., Demircan M.L., 2006. Determining key capabilities in technology management using fuzzy analytic hierarchy process: A case study of Turkey, Information Sciences 176 (18), 2755–2770. Göleçt A., Tas kın H., 2007. Novel methodologies and a comparative study for manufacturing systems performance evaluations, Information Sciences 177 (23), 5253–5274. Lin, C. J., & Wu, W. W. (2008). A causal analytical method for group decision-making under fuzzy environment. Expert Systems with Applications, 34(1), 205–213. Liu, H., You, J., Lu, C., & Chen, Y. (2015). Evaluating health-care waste treatment technologies using a hybrid multi-criteria decision making model. Renewable and Sustainable Energy Reviews, 41, 932–942.